I recently picked up “Common Prayer — A Liturgy for Ordinary Radicals” by Shane Claiborne, Jonathan Wilson-Hartgrove, and Enuma Okorro and have started using it for my personal devotional practice. All three are folks that I have respected for some time, and the book is basically a daily office but with a perspective that recognizes that our faith must be lived into action. As a way of accountability for me, and also in the hopes that I might actually discern a piece of the Kingdom from time to time, I have started a new “mini-blog” on Tumbler will will have my reflections originating from my interaction with “Common Prayer” I have my first post up this morning, which considers the impact of St. Rosa Park as a witness to God’s work in the world. 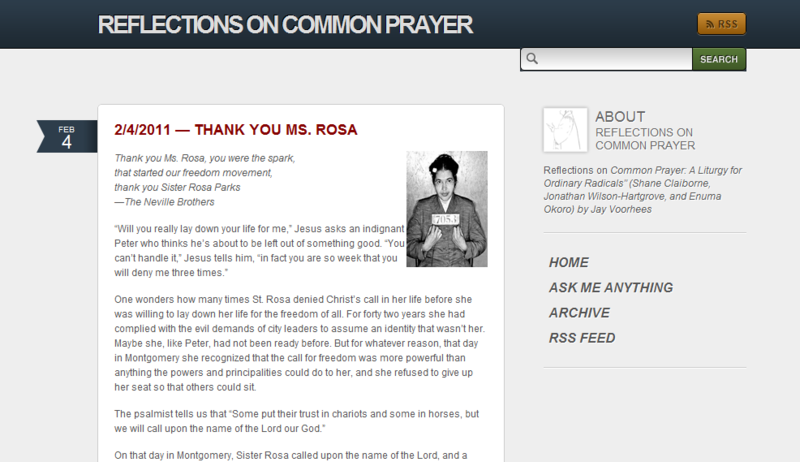 You can visit the site at http://commonprayerreflections.tumblr.com/ and I will also be adding a block with recent posts to the sidebar.